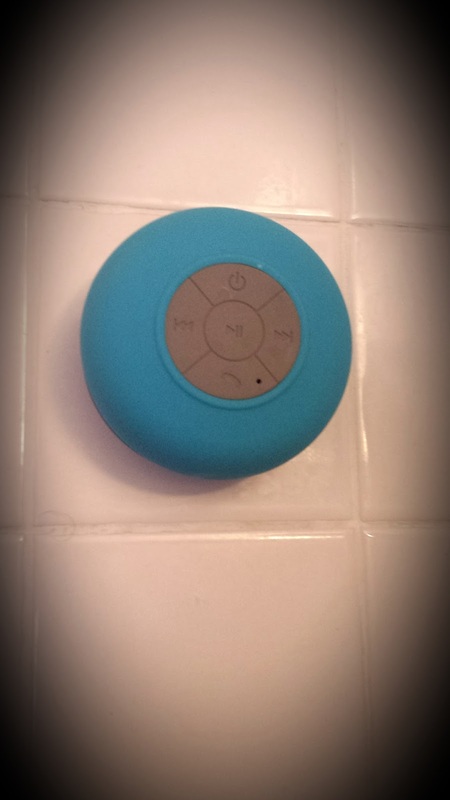 I know my kids would love a shower speaker! My friend Hollie from Peace, Love, and Savings gave one a try, and her review is below. If you'd like to give this a try, enter below for a chance to win one! Outgoing Calls. Smooth Silicone Design with Suction Cup. Plays music for up to 15 hours. If you like to start your day, rocking out in the shower, no problem. 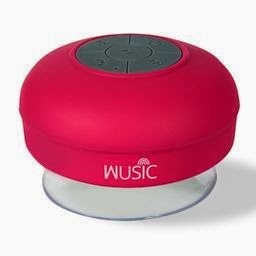 Wusic Waterproof Wireless Speaker gives you big sound without the worry of damaging your devices. So rock those tiles loud and proud. up to constant use, survive falls and other mishaps without missing a beat. My husband was super excited when I got this little gem in the mail. He always takes his phone with him in the shower and puts music on (I think it is a guy thing). Anyway, he has an iPhone. The speaker on that thing isn't the loudest (I'm not an iPerson). So when he is in the shower with the water running he can barely hear his music. He unplugged this, let it charge about 45 minutes to an hour, turned on his Bluetooth, and jumped in the shower. He LOVED it. It was neat that when he got a call, he can answer it from the shower, and when the call is over it goes back to the music. It also signals when you get a text. He can change songs, you can even redial the last number that called you. The sound is really good too. For the price it is a great investment. The suction cup holds it on to the wall well. He said the only downfall is that you are not able to adjust the volume from the device. You would have to get your phone or iPod to change the volume level. Honestly I can think of several other places you could use this as well as in the shower. You could take it to the pool or beach, and it will keep your phone from getting sandy or wet. It is small, so you can carry it with you where ever you go. I HIGHLY recommend this little gadget! The Bluetooth Shower Speaker is available on Amazon.com. Right now you can get it for only $22.99. But wait...there's more...I've always wanted to say that. The totally awesome people from Wusic are letting me give one away! How awesome is that!! Just enter on the form below! I love everything! Um, I even listen to Disney music. Don't care much for Heavy Metal though. My favorite type of music is modern Christian music, like by David Crowder. I favorite type of music is today's country and southern rock. I like just about all kinds of music, with classic rock and pop being my favorites! I would say pop music is my favorite. I actually prefer to listen to audiobooks while I get ready in the morning. My favorite type of music is rock music.. I like that old timey rock and roll....the kind of music that soothes my soul. I like folk music with a little bluegrass. A lot like The last Bison or Mumford and Sons. My favorite is Classic Rock and Southern Rock. I really do love all different kinds but if I really had to choose...ROCK! Music choice for me has always been classical and good old jazz. I like pop and country mostly. I can enjoy just about anything but rap and opera. I love pop music and world music. I love listening to classic rock.